The best coffee in the heart of the community. 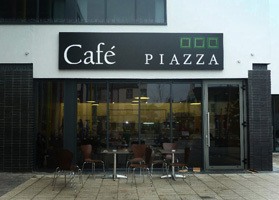 Cafe Piazza is situated next to the Roe Valley Arts and Culture Centre in Limavady. Opened in February 2011 we pride ourselves on the excellent coffee we brew, the delicious pastries and sandwiches and dedicated customer service. With Wifi in store you can work or surf while you relax. We hold music evenings, host various local groups and get involved with the community as a whole. We have our Facebook page that will keep you up to date with little offers that we put up from time to time and there's an iPhone app currently in development. More information of when this is available will be posted up soon.